The Guinness Emerald Crystal discovered in the Coscuez emerald mines is one of the largest gem-quality emerald crystals in the world, and is the largest emerald crystal in the collection of emeralds belonging to the Banco Nacionale de la Republica in BogotÃ¡, the capital city of Colombia. 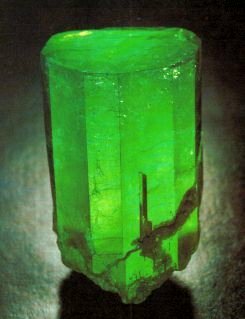 The origin of the name Guinness is not known, but the elongated, 1759-carat, bright green crystal undoubtedly had all the credentials to enter the Guinness book of world records as the largest gem-quality emerald in the world at least for some years until it was surpassed by other larger natural emerald crystals. The 1759-carat "Guinness Emerald Crystal" was at one time the largest natural emerald crystal in the world, and is still preserved in its natural crystalline state, at the Banco Nacionale de la Republica in BogotÃ¡. Emeralds crystallize in the hexagonal crystal system resulting in elongated or flattened hexagonal prisms with pinacoidal terminations. But, the "Guinness Emerald Crystal" is an exception, as it is dihexagonal or twelve-sided, also known as dodecahedral. The exact dimensions of the crystal are not known, but the crystal is undoubtedly elongated, with its length between 2 to 2Â½ times greater than its diameter. The color of the emerald is a bright green color with a slightly yellowish undertone, characteristic of emeralds from the Coscuez emerald mines. The diaphaneity of the emerald is translucent, and some cracks and fissures are visible at the lower end of the crystal. Emeralds from Coscuez are generally more included than those of Muzo and Chivor mines. Certain characteristic features of the crystals and the matrix in which they occur can be used to identify the source of the emeralds from the three main mines of Colombia, the Muzo, Coscuez and Chivor mines. The most characteristic feature of the Coscuez emerald crystals is their frequent occurrence in aggregate type of formations with multiple terminations. The aggregates have a step-like appearance and sometimes a tabular appearance. It is not known whether the "Guinness Emerald Crystal" of Coscuez origin, is also a constituent part of a larger aggregate of crystals. The emerald crystals from Muzo and Chivor do not form clusters or aggregates, however the Muzo emeralds tend to be shorter, while the Chivor emerald crystals are much longer in length. Muzo emerald crystals tend to have a more saturated color than either Coscuez or Chivor emeralds. Muzo emeralds have a deep herbal-green color. The Coscuez emeralds are generally yellowish-green in color, whereas the Chivor emeralds have a bluish-green color. The Chivor emeralds have a lighter color than either Coscuez or Muzo emeralds. But, using color alone one may not be able to predict the source of the emeralds correctly. The Chivor emeralds generally have much less inclusions than either Coscuez or Muzo emeralds. The Coscuez emeralds have diffused gardens and inclusions, but have good color and brightness. The Muzo emeralds also have inclusions but are less apparent due to the deep herbal-green color. Muzo emeralds with less inclusions have good transparency. The matrix in which the emerald crystals occur in the three different sources have common constituents. These constituents are black and grey shale, white and grey calcite, and pyrite. But these constituents are found in different combinations in the matrix of different sources. In the Coscuez matrix black shale is found in combination with either grey calcite or a brown layer of iron oxide, or sometimes only a grey calcite matrix. Thin veins of pyrite run through the black shale. However, the most predominant characteristic of the Coscuez matrix is the presence of grey calcite. In the matrix of Muzo emeralds black shale is combined with pure white calcite, crystallized pyrite and sometimes clear quartz. White calcite and crystallized pyrite are the identifying characteristics of this matrix. In the matrix of Chivor emeralds grayish shale is combined with grey calcite and layers of iron oxide and crystallized nodules of pyrite. The matrix is fragile and has brown stains caused by iron oxide. Because of the fragility of the matrix, fewer specimens with the matrix still intact are found in Chivor. The Coscuez emerald mine where the "Guinness Emerald Crystal" was discovered is one of the three ancient and historic mines of Colombia, which were exploited long before the arrival of the Spanish Conquistadors, the other two being the Muzo and Chivor mines. Both the Coscuez and Muzo emerald mines are situated in the Boyaca district at the northwestern end of the NW-SE emerald belt of the Andes mountains known as the "Cordillera Oriental." The Coscuez mines are situated just 10 km north of the Muzo emerald mines, and share many geological features, even though the Muzo mines are the best known, with an international reputation as one of the most prolific emerald mines in the world. The output of the Muzo mines declined over the years, and today the Coscuez mines have taken the place of the Muzo mines producing almost 60% of the annual emerald output of Colombia. Coscuez is an emerald city, nestling between the craggy mountain peaks of central Boyaca State. Both the Muzo and Coscuez emerald mines are exploited by the open-cut mining methods creating open-shafts and open-pit mines. The Coscuez mines had produced some of the world's significantly large emerald crystals, such as the 7,000-carat "Emilia Emerald Crystal," perhaps the largest emerald crystal ever discovered in the world, and the 1,759-carat "Guinness Emerald Crystal," the subject of this web page. Coscuez, is also the home of Victor Carranza, the renowned emerald mogul who is one of Colombia's richest men and discovered his first gem at the age of 10 years. Colombia, which is undoubtedly the world's leading producer of high quality emeralds, had produced over 60 % of the World's annual output of emeralds. About 1.6 million acres of mountainous land have been identified by geologists as having potential emerald veins, but only about 7,000 acres of this land had been mined since ancient times. Among the factors that militate against a more comprehensive and scientific exploitation of these deposits, are the unstable political climate created by left-wing guerilla activities, that discourage foreign investment, the interference of left-wing guerillas and drug traffickers in mining activity, more as a means of laundering drug profits than a desire for the potential wealth that emerald mining could generate. The legal miners led by Victor Carranza fought back after forming private armies, that led to the death of more than 3,500 people during the so-called "green wars" which eventually ended after the declaration of an informal truce in 1990. Major foreign investment is needed for the development of Colombia's emerald industry, and so far only the Canadian companies have invested heavily to develop the ancient Chivor mines using state-of-the-art mining techniques. Another factor that had discouraged new investment is the speculative nature of emerald mining, in which it has been impossible to confirm the presence of emeralds without a major excavation. Thus the risk factor involved in mining seem to have discouraged major investment. The use of satellite technology to map out potential gem-bearing areas seem to be a possible answer to this dilemma. Even the limited mining activity that had taken place in Colombia so far, doesn't seem to have benefited the country so much, as billions of dollars worth of emeralds had been smuggled out of the country without taxes being paid. Besides, most of the gemstones exported legally out of the country are in the rough form which is less profitable than exporting cut and polished stones either as loose emeralds or set in different forms of jewelry. The Muzo and Coscuez emerald deposits have been found to be around 32 million years old, and are much younger than the deposits found in Chivor which are around 64 million years old. In both Muzo and Coscuez mines strip mining and open-shaft mining have been replaced by tunneling. The Coscuez mines are situated in the same mountain range as the Muzo mines. The main material found in the mines is gray shale, unlike the Muzo mines, where it is black shale. Tunneling in the Coscuez mines starts 500 meters below the peak of the mountain, and the main tunnel travels about 1,500 meters straight into the mountain, with side shafts following the indicators of albite. The output from Coscuez has many fissures that might require oil treatment, a condition referred to as "porus." Colombia is the world's major source of high-quality emeralds producing 50-60 % of the world's total exports. For the year 2000 the total emerald production in Colombia was 8.45 million carats, which represented an increase of 24 % compared with that of 1999. The total value of the exports was $94.3 million. The Banco de la Republica which was constituted as the Central Bank of Colombia on July 25, 1923, plays the role of banker to the banks, as any other central bank in any part of the world. Besides performing normal functions of a central bank such as the issue of legal tender, foreign exchange functions, administration of international reserves, serving as the government banker, fiscal agent and trustee, certain credit functions as laid down by Law 31, the bank also performs the crucial function of promoting scientific, social and cultural development of the country through the creation of foundations designed to select, finance and otherwise stimulate investigations in the field of science, technology, anthropology, archaeology, education, health and humanities. In keeping with this objective the bank has played a part in efforts to rescue and preserve the cultural patrimony as well as in efforts to stimulate its continued development through the creation and administration of libraries and specialized museums through out the country. Two such institutions are the the internationally renowned Gold Museum known as "Museo de Oro" and the "Luis Angel Arango Library." The acquiring and preservation of significantly large emerald crystals discovered in the mines of the emerald belt of Columbia, such as the "Guinness Emerald Crystal" is undoubtedly in conformity with the policy of the bank in rescuing and preserving the cultural and natural heritage of the country. It is said that five unnamed large emerald crystals from Muzo have also been acquired and preserved by the Banco de la Republica weighing between 1,100 carats and 1,796 carats. 1.The Coscuez Mine - A Major Source of Colombian Emeralds - Ron Ringsrud, Gems & Gemology, The Quarterly Journal of GIA, 1986, Volume 22. 2.Colombain Emeralds - by Gary Roskin - JCK Jewelers Circular Keystone, Jan. 1998. 4.The Mineral Industry of Colombia - by Omayra Bermudez-Lugo. 5.The Emerald Deposits of Muzo Colombia -Joseph E. Pogue. Transactions of the American Institute of Mining Engineers, Vol LV, 1917.